Last year, I said that FIFA 18 on Nintendo Switch was the best football game ever made for a handheld device and on a Nintendo console, and I stand by that comment. With a whole year to make further improvements and add much-needed features, I can now say with as much certainty as I did last year, that FIFA 19 is the new king. But it’s certainly not without some of the same problems that could be found when we stepped out on the pitch last year. Let’s get this out of the way before we carry on. FIFA 19 on Nintendo Switch is limited in what it can do compared with the other versions of the game. Whether all of the limitations are justified is another matter, but it makes sense that what is essentially a handheld game does not match its home console brethren. Certain modes are still missing, the biggest of these being The Journey – a story mode that made its debut in FIFA 17. The career mode is still lagging behind somewhat too, as it is more or less a copy and paste of last year’s, which was already missing some of the improvements that the other console versions have had for numerous years. FIFA Ultimate Team is also still missing features that are now commonplace in the other versions. This is a massive shame as it is easily the most popular mode and has been for years now. There are still no Squad Battles or Division Rivals. Ultimate Team is still as addictive as always, but just know that you’re not getting the full experience when playing it on Switch. I personally don’t want to get too invested in Ultimate Team as I know I am not getting everything that I am supposed to be. Now onto something EA has added in from last year. In last year’s iteration, the biggest criticism I had was that there was no way to play against friends online. To put it frankly, it was pure laziness on EA’s behalf not to implement one of, if not the most important, features for many FIFA players, including myself. 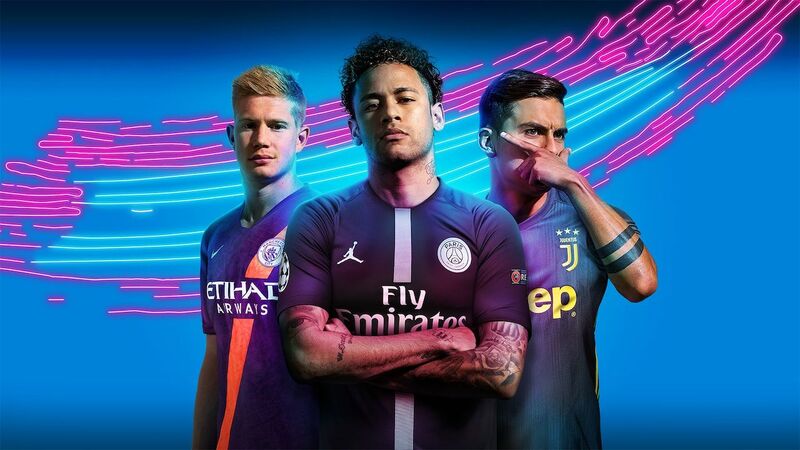 So for that reason, I am not going to praise EA for putting in a way to play friends online in FIFA 19, because it is ridiculous that it wasn’t there to begin with. But, it is here. Just having it as an option makes this year’s FIFA that much more appealing because you know that if your friend has a copy, you do not have to be in the same room as them to play against them. It works just as easily as it should, too. You choose a player to invite from your list of friends that play FIFA 19 and they accept, simple. I am not entirely sure why that was such a difficult feature to implement a year ago, but let’s move on. The biggest scoop (at least in EA’s mind) for FIFA this year is they have bagged themselves the license for the Champions League. It doesn’t really mean that much to us, however, as all it really equates to is yet another cup competition to play through, just with different commentators and the authentic logos and music to go with it. It is a nice touch but nothing more. The best new features for me personally, are the new House Rules setting embedded within the Kick-Off mode. Here, rather than just playing a standard match like in every other FIFA game, you can alter settings to have a different kind of match to keep things fresh. Firstly, you can now choose a single match, a home and away tie akin to what you would find in knockout stages of the Champions League, best of three and best of five. Now technically, all of these were possible anyway, with the exception of Home and Away, but now it conveniently sorts it all out for you. Next up is King of the Hill, which is great if you have a group of you playing. Whoever wins gets to keep playing but they cannot swap sides or teams. Next, we have Random Teams, which again, people have been doing for years, but now you can set it up so nobody cheats and has one extra reshuffle. We all know that one person. Match type holds the best that House Rules has to offer though. Firstly, we have survival, a mode in which when a goal is scored, a random player from the scoring team leaves the pitch and cannot be replaced. A maximum of four players can leave the pitch, so you could have a game where, at one point, you are playing eleven against seven, so it might be difficult to hold on to the lead. Next is Long Range that makes goals scored outside of the box worth two goals rather than one. First to 2 is next up and it’s basically what we all used to play as kids, whoever scores two goals first, wins. Headers and Volleys, another game we all used to play is next and it is exactly what it says it is, only headers and volleyed goals are allowed. Any goal that is scored from the ground is immediately chalked off the board; it is a lot harder than it sounds. Lastly, we have my favourite of the bunch, No Rules. In this mode, there are no fouls or bookings and no offsides, meaning anything goes. Is an opponent through on goal and no hope of making a legal tackle? Well now, you can just hack them down and it’s all good. What really matters above anything else is the gameplay and FIFA 19 plays just as well as you would expect it to. You can instantly feel that it plays better than last year’s outing without really making massive strides, but then that is what FIFA has always done anyway, small and steady improvements year-on-year. Most importantly, it’s fun and it remains fun regardless of how many matches you have. It offers a smooth framerate and you always feel in control with lots of different types of passes and shots to execute. Dribbling with the ball feels a touch more responsive than it did last year and it is easy enough to start pulling off some tricks once you get used to the core gameplay. Certain things can be an annoyance such as the lofted through-ball, which still doesn’t work as you envision it to. The obvious benefits of playing FIFA 19 on Nintendo Switch remain, in that split Joy-Con support means you can play two-player right out of the box and, of course, you can play it wherever you go. For me, 90 percent of the time I spend with the game, I play in handheld mode (including last year’s game) meaning that it is such a big feature for me to be able to play it wherever I am. More than anything, it means I get to spend a lot more time playing the game, as it is not always possible for me to spend hours in front of the TV playing games and when those occasions do come along, FIFA would not be my first choice of game, that’s for sure. So being able to play one game here and there is a godsend. Last year, FIFA 18 was given a free pass in certain aspects as it was the first FIFA game on a Nintendo console for years and the core gameplay was as good as I wanted it to be. This year, I am not letting FIFA 19 off as easily. Don’t get me wrong, I still have endless amounts of fun playing matches online and my most wanted feature, being able to play online against friends, has been added. With that being said, there are still so many features that EA is holding back for some unknown reason and, until they are implemented, it still feels like a missed opportunity. There is no doubt it is better than last year’s FIFA, but it could have been so much more.